The inside passage region of Alaska is a wonderful wilderness landscape that poses a number of challenges for photography. The first is access. 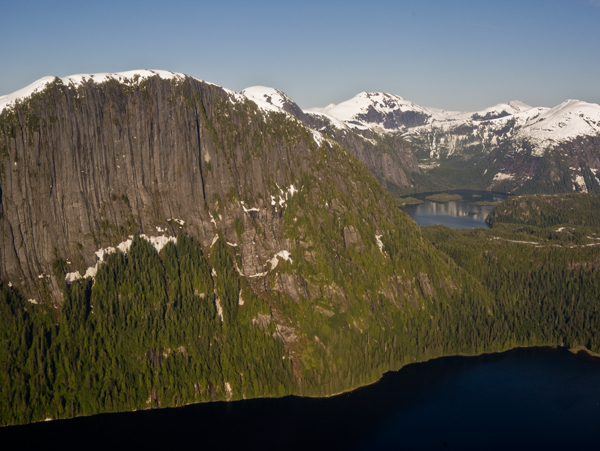 Many of the most scenic areas require a long boat trip for access at sea level, or an expensive float plane trip that results in mainly aerial views. We decided to take a small boat cruise because it would allow us to visit remote areas that the big cruise ships cannot reach, and because relying on the Alaska ferry system would limit our stops to developed towns. Being on a small boat allowed access to small islands and inlets that would be difficult to reach otherwise. We were able to get in sea kayaks or skiffs to go ashore most days. We used the buddy system when hiking since this area has a large population of brown bears, which you do not want to surprise in the wilderness. I was able to get most of my landscape shots on these shore excursions. The rest of my photography was limited to shots from the boat, therefore it was a challenge to get a 3 dimensional composition since images always consisted of ocean followed by an assortment of mountains, sunsets, etc. We took a floatplane trip into the Misty Fjords area from Ketchikan, and I was pleased with a few of the shots I was able to get from the floatplane. The challenge with airplane shots is to minimize window reflection by not shooting at an angle, and to use a fast shutter speed. There is not much time to grab a shot before it is gone, so you have to be quick. I was hand-holding the H3D in the airplane with a 50-110 zoom and that worked fine, although in hindsight I should have used an ISO of 200 instead of 100 to get faster shutter speeds. The new Camera Raw 4.1 has amazing noise removal capabilities that I think dramatically improve the results from shooting at a higher ISO - if I had known this before I left I would have used a higher ISO than 100 on my handheld shots. 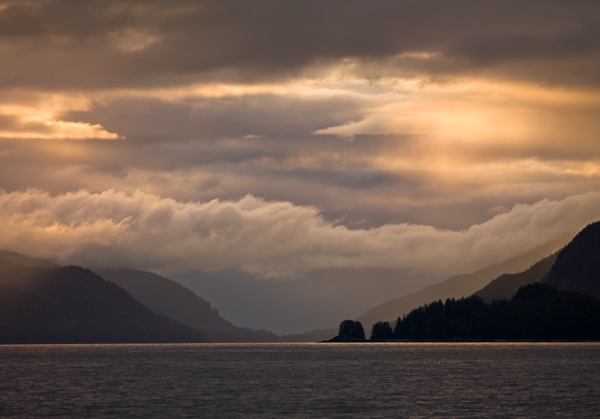 I am still working on my selected portfolio images from the trip and will post those next week, but here are a few - the sunset was taken handheld from the boat, and the Misty Fjords shot was taken from the floatplane. The immense scale of the Misty Fjords landscape is hard to describe - you can get somewhat of an idea by comparing the size of the very large trees to the cliffs and the shoreline in the image. These images look terrific. I'm looking forward to seeing your final images that you select.